Apple’s iPhone is without a shadow of a doubt a real competitor for most ‘real’ cameras out there, as is perhaps evidenced by the fact that it is once again the Flickr’s most use camera of the year. People love taking photos with their iPhone, but we bet they don’t love taking photos of anything that requires a flash because, even with the newest iPhones featuring an improved flash component, it’s still not very good. This means that the market for third-party flashes is a relatively large one, and with CES just finished one new flash that has everyone’s attention is the Knog Expose. If the name rings any bells, that’s because Knog is the same company that makes super-bright bike lights, so the firm certainly knows what it takes to put some quality illumination together. With that in mind the Expose should be pretty decent and, as it turns out, it’s really rather good. Packing nine LEDs that can kick out up to 130 lumens of light, the Expose can be remotely controlled via an iPhone or iPad via the super useful Bluetooth LE connection that it offers. When connected in such a manner the light can be controlled without having to touch it, meaning those shots that need additional light need not be quite so fiddly as they used to be. Able to offer continuous light for video filming as well as flash and strobe options, the Knog Expose should be enough to keep most amateur photographers happy. Throw in the fact that it will cost just $60 when it goes in sale in a matter of weeks as well as its diminutive size and weight and the Expose is one flash that should be at the top of everyone’s wish list. It’s just a shame it’s coming out the wrong side of Christmas, really. 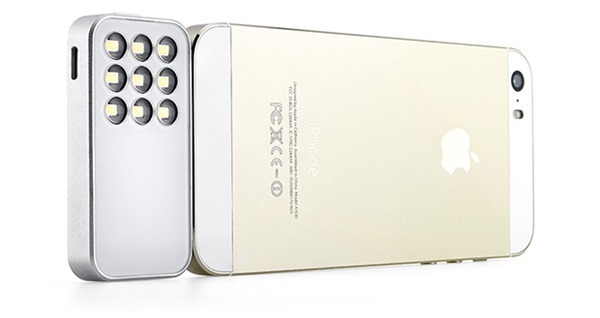 Too bad it’s also in the shape of the iPhone 5 and won’t match up as nicely on the 6 or 6+.